I’m not really crazy about figs, but my friend has a huge fig tree in his back yard and he invited Marie and Judy and me to come over and do some pickin’ after mass tomorrow. Since I’m hot for anything free, I guess we will do some pickin’ even though we will melt in the heat which is predicted to be 100 plus – REAL temp. Besides one fig has only 37 calories and they are so sweet! But they also have 10 carbs per fig and I’m watching carbs these days. I might as well have a bag of M & Ms.
Yvonne – who declined the offer to go with us, but wants some figs – told me what to do with them. It’s a kind of cheaters recipe for strawberry preserves. She also said she sometimes just boils them in water and puts them into jars. Refrigerated or frozen, she claims they are almost as good as fig preserves. One problem – you must peel them. The rich potassium content of figs and the dietary fiber, makes them very effective for weight management program. I like that! 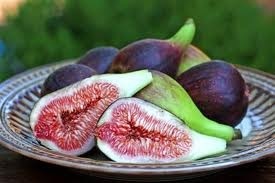 Consuming figs helps to reduce the risk of breast cancer. Really? Figs promote the overall well-being of an individual and are excellent aphrodisiacs. I’m sold. I’m going fig pickin’. This entry was posted in Food & Entertainment, Gardening and tagged Fig pickin', what to do with figs by Emily Jones. Bookmark the permalink. Never, in my entire life have I ever heard of anyone peeling figs. What’s wrong with the skin? Years ago, I use to make this jello preserve with figs. It was good then with the skins – imagine it would be just as good now. Also, check out Splenda – we heard on Coast to Coast Radio that it kills fire ants. Emily, I don’t peel the figs used for fake strawberry jam/preserves. 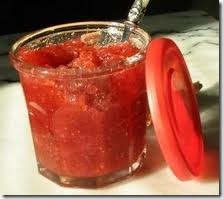 The jam tastes just as good and is sooooo much easier. A friend has used Splenda with no problems. We didn’t have so many figs this year, but I sure have enjoyed them the way I prefer, fresh off the tree. Thank you Jacque – I was thinking peeling all those figs would be a horrible chore. Will do it your way! Is your recipe the same as mine? No joke! Have you made the preserves with Splenda? That would be great. A friend just gave us a bunch (is that right) or a mess of figs? Anyway we got a bag of figs and were trying to find a way to use them. We found a recipe on the internet for figs and lemon chicken. The figs are baked in the oven with the chicken and lemon slices. It is a middle Eastern recipe, but very good. The figs and lemon slices were very tender and could be eaten together with chicken breasts. All of the items were cooked with a splash of a lemon juice, vinegar and brown sugar mixture. That sounds fantastic. Did you marinate the figs and chicken in the juice, vinegar and brown sugar or just pour it on before cooking. How long should I bake and at what temperature. Thanks much. hello, would your neighbor like to trade some fig tree cuttings? I have several great varieties I can share with them and would love to try to grow the fig tree they have . please email me at ediblelandscaping.sc@gmail.com if interested.